A researched based 22% patented protein, high-energy pelleted ration to supplement the unique dietary needs of mule deer. Specifically formulated for mule deer. For top antler growth, reproductive performance and overall health. ANTLERMAX® PELLETS - For the development of optimal antler size and mass. Provides for a high intake of high-quality proteins including AntlerMax® By-Pass Protein technology that deliver high concentrations of amino acids needed by the growing antler. Helps develop deer with exceptional body size. High-quality protein helps maintain muscle to support body growth. OPTIMUM LEVELS OF VITAMINS AND MINERALS - Helps promote antler growth, density and strength. Optimum levels of calcium, phosphorous, magnesium and vitamin D. Contains proprietary AntlerMax® Mineral Technology including organic trace minerals for replenishing depleted bone material stores used during antler mineralization. HIGH FAT CONTENT - 4.0% fat from several high quality vegetable oil sources that help deliver a high percent of fat directly to the growing tissues. Helps deer regain body condition quickly. HIGHER PROTEIN SUPPLEMENT TO LOWER QUALITY DIET NORMALLY AVAILABLE TO MULE DEER - Mule deer food plants are often limited in availability and nutritional quality due to drought and other environmental factors. SUPPLEMENTS POOR OR SPARSE FORAGE - So deer can maintain vigor during periods of environmental nutritional stress HIGH PALATABILITY - Enhanced with flavoring to attract deer to the feed so they receive the benefit of a balanced diet. 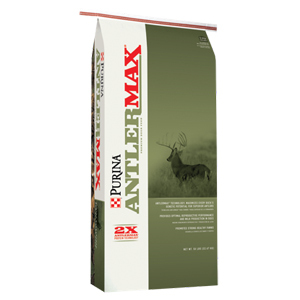 ANTLERMAX® MULE DEER 22 FEED is a researched 22% protein ration. Specifically formulated for what free range deer require for top overall health, reproductive performance and antler growth.